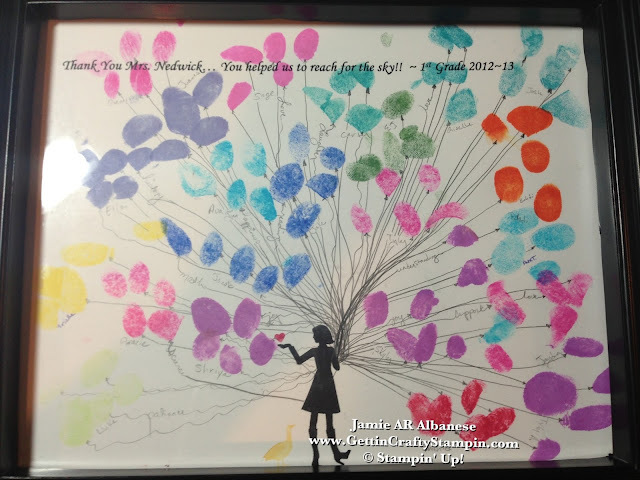 Getting Crafty with Jamie: Teachers help us SOAR!! Our School has the most amazing teachers! I'm not biased... there are a long line of teachers that wait to get into our school.... and we have been blessed to serve at school and really get to know these ladies!! 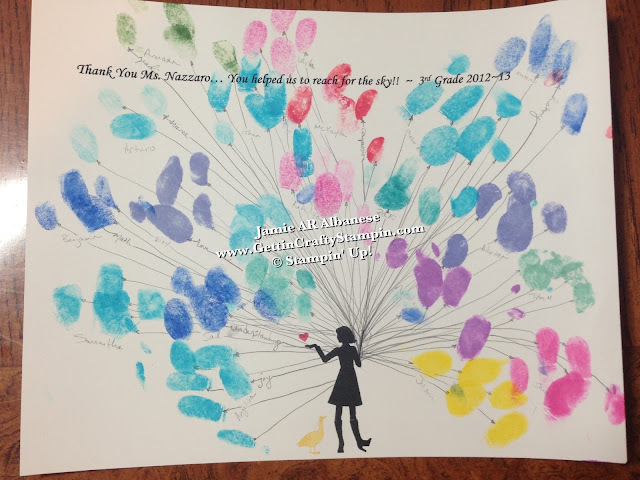 This is the Thank You we created with the help of my kids and their classmates!! Incorporating our ink and this Million-Dollar Moments hostess stamp set (retired - from the Spring Mini!!). Let me know what you think, leave me a comment and joining in on the fun! 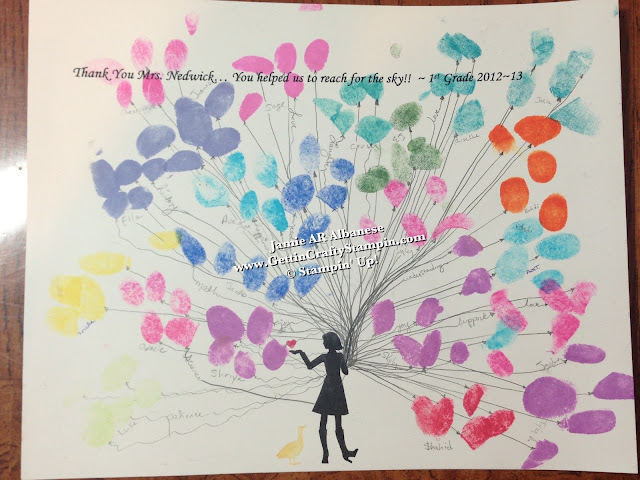 With our Stampin' Write Markers you can color part of the image to stamp only what you want... here I didn't color the umbrella.. so she can represent the teachers who helped us soar and the one heart vs. raining hearts. 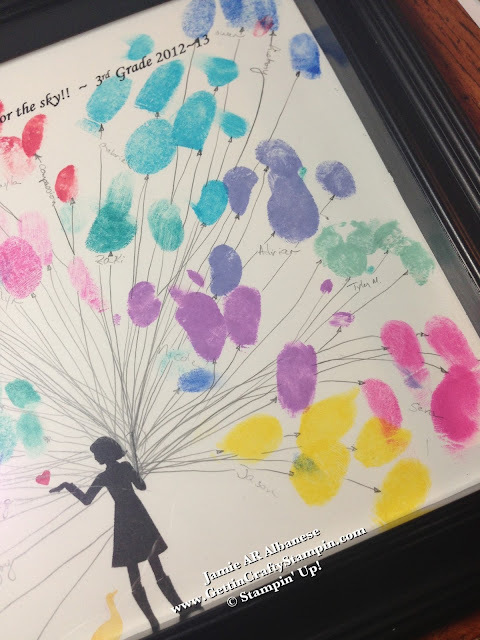 I used my old Stampin' Spots - mini stamp pads that we no longer carry - but they were perfect for our little kids fingers and so easy to transport for this rainbow effect. Inspired by the movie UP! 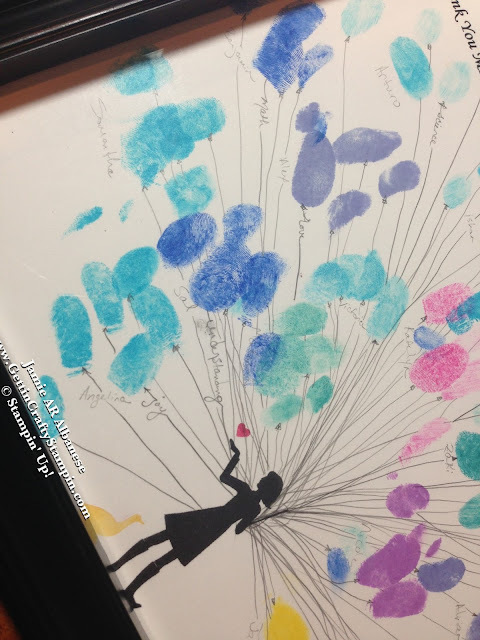 our little fingerprints came together so well! Adding words to random strings - words of inspiration and schooling and science to tie into our school, a Science and Technology Magnet School. 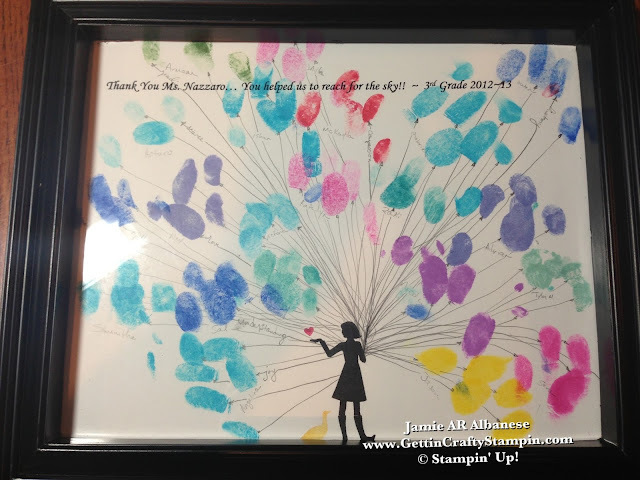 Isn't this a fun spin on the Teacher Appreciation gift and so colorful, much like the kids in our classrooms! I love the little duck and the whimsy she adds. This may be one of my favorite stamps - I love silhouettes... and her sassy pose, boots... the duck is the icing on this calorie-free cake! Retired Stamps may become some of your most favorite and become busier than ever! Printing on this picture was scary - who wants to mess it up?!?!! I LOVE the Results, don't you?? My daughter's 1st grade teacher had my son and encouraged his love of learning - his 3rd grade teacher really helped it to flourish this year! That's my Sal, in the red angry-bird shirt and blue Dodgers hat... he's grown up with most of the kids - from Kindergarten to wrapping up 3rd Grade!! They head into 4th Grade and new discoveries... 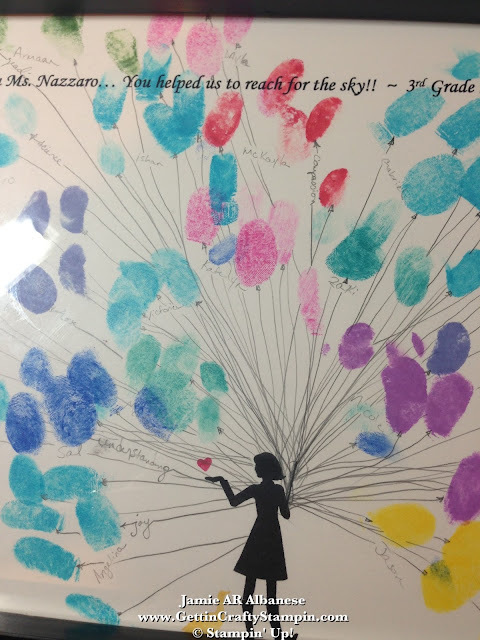 Thank You Ms. Nazzaro, you have helped us to soar! YEAH!! School is OUT! My Little Genevieve is in the middle, in front of our beloved Mrs. Nedwick - the black shirt and hands folded in front of her... she has become a friend and nourished two of my kids (with more to come through her class in the near future). We had a fun year with many ups and downs, growths and new adventures! 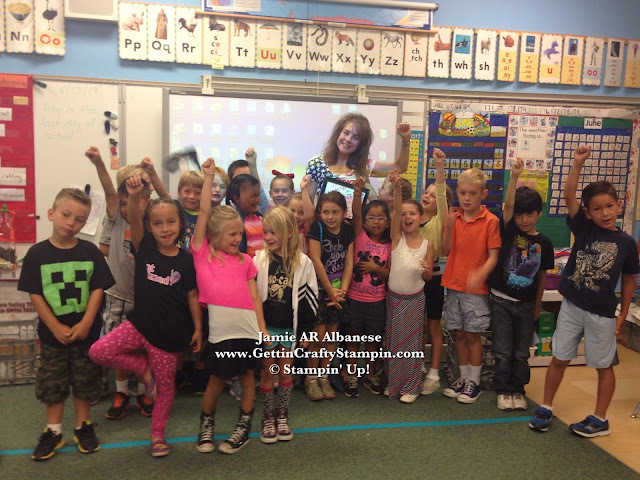 A classroom full of colorful kids and much laughter. When you are blessed to have teachers that support you, your parenting, your children and give them a joy of learning... you are blessed beyond measure! Iiiii still remember some amazing teachers in my education/life - they left a huge impression on my life... let me know who left an impression on yours! Who do you Celebrate, Thank, Honor?? 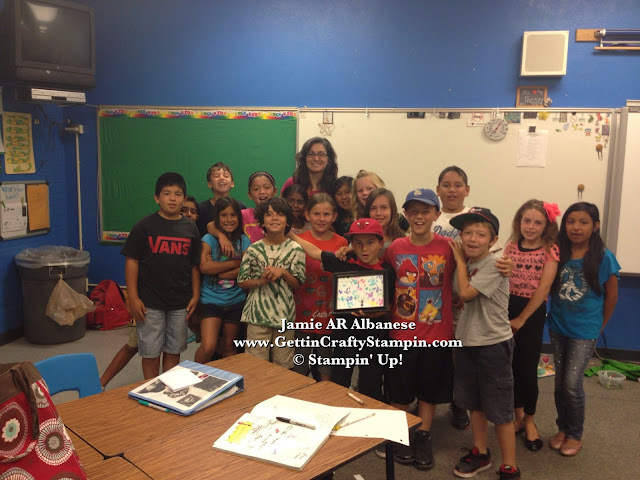 Join in on the FUN with the aide of our Stamping and Crafting tools. CLICK HERE and see our FULL Line of Stamps, Papers, Accessories and Tools! Awesome Year filled with Awesome kids!! Reasons to celebrate and fun doing so! Join ME on this walk we call life... Share Me with your friends and family, Pin Me and My Projects, Facebook, Tweet, Instagram.... I'm on all of those avenues and walk along life with me, it's more fun than being alone in this world - lol!! it's great connecting with you!